The CD54HC646 and CD74HCT646 consist of bus-transceiver circuits with 3-state outputs, D-type Flip-Flops and control circuitry arranged for multiplexed transmission of data directly from the input bus or from the internal Registers Data on the A or B bus is clocked into the Registers on the low-to-high transition of the appropriate Clock (CLKAB or CLKBA) input. Figure 1 illustrates the four fundamental bus-management functions that CAN be performed with these devices. When an output function is disabled, the input function still is enabled and CAN be used to store data. Only one of the two buses, A or B, CAN be driven at a time. 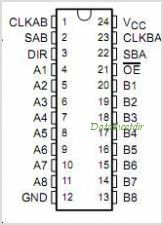 This is one package pinout of CD74HCT646,If you need more pinouts please download CD74HCT646's pdf datasheet. CD74HCT646 circuits will be updated soon..., now you can download the pdf datasheet to check the circuits!